In a recent newsletter I shared 7 Processes And Tools That Make My Life Easier and asked readers to share what works for them, so I could collate them all and share their tips and processes with mine here on the blog. I had such a fantastic response which, you can see below and appreciate the time readers took to send in their ideas. Feel free to add your tips in the comments section at the end of this post if you have other tools and processes that help make your family life easier. I have written extensively about menu planning on the blog which you can read by clicking here – menu planning FAQ. Before running with a formalised weekly schedule, work and home life blurred significantly with negative impacts. It made me feel like I was always doing both roles and not doing a great job at either. The schedule is set by me so flexible, but the most important thing it does for me is take decision making out of the equation. I know what I should be doing when, I don’t have to think about it and make choices. Simplifying my life so I have to make minimal decisions over the mundane areas of home and business life, mean I have more energy and time to make big decisions. You can read about how I create my weekly schedule by clicking here – How to create a weekly schedule..
Terina – My morning app reminding me of my “daily chores”. My to do list for the day ie blocking time. Google calendar – as soon as I commit to doing something I write it in and can forget it. Saves my brain! I too love Google Calendar and you can read about how I use it here –5 simple family organisation tools . About 18 months ago we bought a new vacuum cleaner. It is a backpack style one like you see commercial cleaners using. It has a long cord which lets me vacuum the entire house without having to unplug. It is so easy to use, has great suction and allows me whizz around the house and vacuum in much less time. The only thing I would change with hindsight about my food processor is to have one with a bigger motor. It takes me ages to make nut butters as I have to do it very slowly so the motor does not over heat. It does has an overheat cut off which is awesome as I have made it go off many times when making almond butter. I have an older version of this one which is only 1000w and it is a great reliable machine. Because of the way I use a food processor however, next time I would get a food processor that was 2000w. I like the look of this one which has a wide food chute. That means you don’t have to spend so much time cutting up the veggies before you process them. Having everyone in the family undertake household tasks is a huge winner for me. Not only does it mean I have less to do, but it also makes me feel less resentful to everyone. Ever felt frustrated that you are the only one doing any of the cleaning around the house? Then start a family contribution schedule and get everyone doing something. Yes it does require management and in the initial stages it would be quicker at times to do it yourself, but stick with it and it will pay dividends when like me, you can have a teenager do a pretty good job of cleaning the main bathroom on a regular basis. You can see an example of our family contribution schedule by clicking here – Our family contribution schedule. This simple and inexpensive smoothie maker was instrumental in moving my family from a boxed cereal breakfast to real food (you can read about our change by clicking here). It worked for us because it is simple, safe and easy for the kids to use so they can make themselves a smoothie themselves. Collette – Getting my two older children to take turns each day emptying the dishwasher in the morning, makes cleaning up from breakfast half the job. Who ever isn’t on dishwasher duty is on recycling duty – putting them out in the big yellow bin at the end of the day. Allowing my eight year old to change and dress my 2 year old – both love it! Ellen from Potential Psychology – My eldest is now almost seven so I’m starting to train him up on emptying his school bag and giving me notes, lunchbox etc after he gets home from school. He’s also brilliant at getting dressed as soon as he’s out of bed – thanks go to his dad for training him up on that one – so I know I don’t have to nag him in the mornings. Sachi – place for everything saves time looking for things and everyone know where things are. Kids can get what they need without adult help. I keep cups in a lower drawer so that they can get a drink themselves. Jacinda – Teaching the children (age 5 and 6) to do simple chores after school before being allowed to watch tv (this is a work in progress! ), inc bringing lunch boxes to the kitchen, shoes and school bags by the door ready for next day, dirty sox etc in the laundry, clean folded clothes up to their rooms. Jacinda – Getting my children in the bath while I’m cooking dinner as opposed to after dinner (my husband is never home till late), so there is no rush after dinner and dinner is more relaxing. They can now mostly bath themselves which is awesome! Elmien – I set the kitchen timer for everything, for example: If the kids are watching TV and there is ten minutes left until bath time, I will tell them the amount of time they have left for watching TV and that I’m going to set the timer. I can carry on with my chores without watching the clock and when the timer’s bell goes, they switch the TV off without me having to get into a debate about it. I use the same method for homework time, when the have to tidy up, etc. Tamara – The tool I’m loving the most right now is my Tupperware. Despite their initial expense, they actually save me money and earn back their cost rather quickly. Between their fridge containers saving my food so I don’t throw it out, or my heat’n’eat containers making it easy to take food from freezer to microwave so I don’t get take out, or my fantastic steamer making fast, healthy, food for the family when I’m exhausted and normally get pizza or cancel my activities that night, it’s saved me lots of time and money. I’ve had so little energy since having my second child last year and it has really helped to make my healthy meals go further, without using yucky glad wrap. I’ve been so impressed with Tupperware I ended up recommending it to everyone, they finally told me I should become a consultant, guess I was getting annoying! Haha! I honestly think every mum should have at least one of those products to make it easier to eat healthy food. Prioritising my own wellbeing – As a mum it is so easy to loose sight of yourself while you take care of everybody else but I think it is important for Mums (and Dads) to realise that they are no good to anyone if they are tired, moody and overwhelmed. The best solution I have found to these feelings is to start to look after yourself. Make time for that yoga class or walk along the beach, make your own lunch while you are packing the kids lunchboxes so you have something healthy on hand and plan a night out with your girlfriends or hubby once in a while. These little acts of respect for yourself all add up to you feeling more energetic, happy and balanced. Karen – Meditation would be the other tool that has made a big difference to me, and my family. Much calmer mornings! Jacinda – Starting to work in an office outside the home (I used to work from home). This means the boundaries are much clearer for everyone, I am not always at home and constantly doing domestic jobs in amongst my work. It also means I have to leave the house at 8am so my husband has taken on doing the school run on his way to work, he also has to finish breakfast with the kids etc so i have much less resentment about doing ‘everything’. Jacinda – Cycling to work as opposed to taking tram. I enjoy the cycling, it’s quicker, and it’s covering my exercise for the day so I no longer have to get up at 6am to go jogging (or more like failing to get up at 6am then feeling guilty). Tamara – my fortnightly cleaner. $80 very well spent! The alternate week I can do a pretty quick clean and it is such a treat to come home to a beautifully clean house. I would give up many things before I gave up this. Ellen – In terms of general organising, I make sure that all lunches are made, bags are packed and clothes are laid out (including mine) before I go to bed at time. I’m NOT a morning person so we need to have as little to do as possible if we’re all going to get out of the door on time! Sachi – Talk and share the family schedule with the children regularly (daily, sometime a few time through the day) so we all know what is happening. Julia – Another really important one for me is taking time at night to prepare for the following morning. A few key things, eg tidy up, clean kitchen, dishwasher on, rubbish out, load of clothes going in the machine, lunch boxes ready, school notices sorted etc… makes for a much smoother and more peaceful morning the following day! This works even better when my husband clicks & joins in, so that we can both relax together afterwards! Amelia – Cheap and easy: having an extra jumper, hat and school uniform purchased from the school secondhand shop so it’s not a disaster if something is misplaced/lost/gets dirty or it rains for a week non-stop! Julia – One tool I use regularly is setting myself a time-limit for tidying up. Let’s face it- with a busy young family, the house will never be perfect, and I could clean all day every day. But that doesn’t leave much time for other (more valuable) activities, like playing with my children. So when I embark on a tidy-up, I set myself a time-limit and stick to it. I find that I’m more efficient this way, as there’s a deadline in place, and a reward (such as a cuppa/play) afterwards. I have a large double electric steamer which was given to us as a wedding present. It gets used multiple times a week at our house. I used it even more when I had babies as it was a great way to make food the little ones. Elmien – The steamer is very convenient for cooking veggies and not have to worry that it is going to burn on the stove. I can set the timer and forget about it. You even get steamers with a function where it will keep the food warm for a while after the time has run out on the timer. Sometimes it is just the small things that help make life easier, like finding homes for things around the house My husband is great this and I wrote this post highlighting his skills! Alice – I get lots of baskets at charity shops and sort their toys by type into these. This makes tidy up quicker, helps them to find what they want to play with, and makes lounge look nicer (nearly all toys here as bedrooms on a different floor). Pressure cookers came highly recommended by readers too! Ellen – I also have a Ronson Pressure Cooker that I bought at Target and use several times a week. 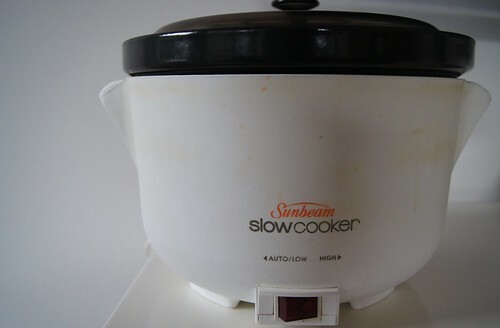 It’s like a slow cooker but fast and it does a great job with curries, casseroles, shanks, corned beef – even risotto, boiled eggs and mashed potatoes. Putting some planning and preparation into the meals you cook for you family was a process many mums use. This goes beyond just planning the meals, but starts prepping veggies and meats or even making meals in advance. Ellen – Batch cooking is also a winner for me! Jacinda – Organising regular grocery deliveries. I do this with Aussie farmers. After an initial set up it’s very easy to use and to change your order on your ph app. I get fresh bread and eggs etc delivered Saturday mornings for a good start to our weekend, and a big grocery order mid week. I hardly ever need to go to the supermarket anymore, only for cleaning supplies and bulk basics which I also get delivered about every three weeks. Julia – doing some food prep for dinner during the day. If I can have meat defrosted, veggies cut up, and other ingredients out and ready to use, it makes the actual cook so much quicker and easier. Often its at this time of day that I have a tired, cranky toddler hanging off my leg, and I’m trying to help the older two who are sitting up at the bench with their homework. Stressful! But not as much if I’ve done some prep earlier in the day. And if you follow me on facebook, you will know I do a weekly food preparation session. Each weekend I make up savoury and sweet items for the kids lunch boxes, cut up veggies and make items from scratch for myself like kombucha, dukkah, garlic aioli, sweet chilli sauce etc. Below is a recent example. Doing this prep on the weekend when I have more time means after school time is less rushed and calmer. Anytime I batch tasks like this, I always save time. Coconut rough – gifts for friends who helped out while I was away. Taco seasoning – made a new batch. Left over taco meat for my lunches. Want to become more organised? Over the years of having five kids, I have worked out that planning for the known elements of family life means I am in a much better position to cope with the unknown that family life throws my way – the fighting kids, the sick kids, the extra activities etc. I have collated all my best plans, processes and tips in my e-course Planned + Present. With the drive of wanting to be organised it can be easy to forget why we want to be organised – to be able to spend more time enjoying our family. The course teaches you how to establish plans and processes for those repetitive tasks of family life, allowing you to be more effective and efficient with your time, so you can be more present with your family.